Michigan-based NetShape International is one of the largest injection molders in the automotive arena, working with a wide variety of companies to create high quality parts for their common end customers, the automotive Tier 1 suppliers and OEMs. 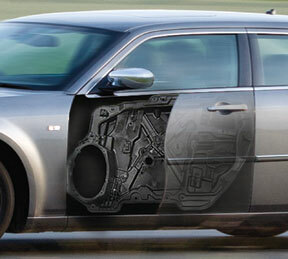 The automotive industry is well known for operating with pinpoint planning schedules, so NetShape was put in an unexpected bind when one of its resin suppliers suddenly announced that they would not be able to honor their commitment for providing a long glass fiber reinforced polypropylene material used to mold door carriers. Door carriers are large parts that provide an internal frame to which a host of components such as door handles and window regulators are attached to create a unified subassembly. Long fiber reinforced thermoplastic is used because it’s a lightweight and cost effective material that can be molded into complex shapes permitting integration of components. Ironically, NetShape had become involved with the door carrier program less than a year before, when the previous molder’s best efforts repeatedly fell short of meeting customer commitments. NetShape was chosen to take over the program because of their outstanding reputation for providing quality service and products. NetShape stepped up and met all outstanding commitments and also applied additional value using their manufacturing process. By expertly optimizing the material processing using the same tooling, they succeeded in reducing part warp by 50%, producing a higher quality product. “The door carrier had been specified with a particular OEM approved material and the supplier offered no back-up plan,” said NetShape Product Development Engineer Scott Hayes. Fortunately, NetShape knew of RTP Company, which had done some well-received work for one of its sister companies, and sought their assistance to resolve the supply problem. After discussing the door carrier’s demanding specifications that included tight tolerances and automotive OEM approval, RTP Company quickly provided a very long fiber compound that would meet the demands. “To get out of this pinch, the OEM directed us to start testing to determine if RTP Company’s material really was a spec material equivalent,” said Hayes. NetShape did the work, and found that not only was the material comparable, but the RTP 100 Series very long fiber reinforced polypropylene compound enabled them to produce door carriers with even less warp than the previous material. “Not only is RTP Company’s material now the official material for this door carrier application, we are in the process of making it the official material for our other projects that utilize long glass fiber reinforced polypropylene,” said Hayes. NetShape International is a global leader in the design, development, and manufacturing of impact energy management systems; they are a part of the Shape Corp. family of companies. For more information visit their website at www.netshapecorp.com.